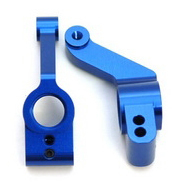 Aluminum Rear Hub Carriers for Slash 4x4 (Blue) 1 pair Discounts Apply ! SPTST1952B - Aluminum Rear Hub Carriers for Slash 4x4 (Blue) 1 pair. CNC Machined from high-grade aluminum, our rear hub carriers features a set-screw over hinge-pin design that securely keep the hub carriers on the hinge-pins, and also keep the wear to a minimum by making the hinge-pins rotate in the arms and not in the aluminum hub carriers while also increasing the durability and adds awesome factory look to your Slash 4x4. (Note: setscrew in rear hub to be used with ST3640RS and ST3640RBK lock-nut style rear outter hinge-pins only. Set screw is not used with kit type hinge-pins). These are zero deg. Hub carriers with no additional toe-in degrees.